The University of Iowa Music Library purchases a subscription to several online music streaming services. The largest of these is Naxos. Naxos contains hundred of works for the trombone, including many of the full albums of Swedish virtuoso Christian Lindberg. 1) Go to the Rita Benton Music Library website. 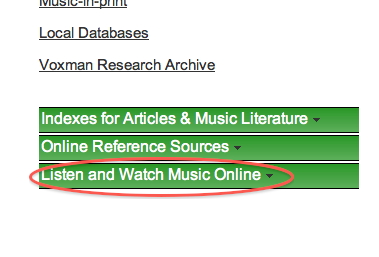 2) In the column on the left, click “Listen and Watch Music Online”. 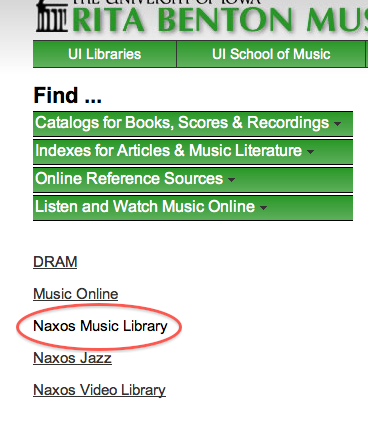 If you are on campus, you will go straight in to Naxos streaming; if you are off campus, you will be required to login with your University of Iowa username and password.